Home > Reference pricing for medicines from the National List of Essential Medicines: what to expect? Reference pricing for medicines from the National List of Essential Medicines: what to expect? 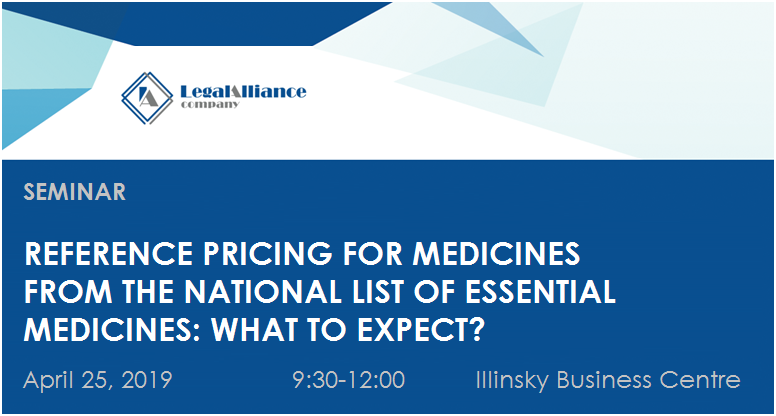 The Legal Alliance Company invites you to take part in a seminar focused on the introduction of referential pricing on some medicines procured using budget funds. Venue: Conference Hall of Illinsky Business Centre, 8 Illinska Str. Your company is a manufacturer of medicines that are being sold using budget costs? Do you import such products by participating in tenders? Are medicines from your company’s product basket being sold in the retail network? Then you definitely need to know how will be regulated prices for medicines that are included in the National List of Medicines and are procured using budget funds starting from July 1, 2019 . What changes should be expected when selling such medicines in the retail segment of the market. Actual steps to introduce new pricing have already been taken: the CMU resolution “On reference pricing for some medicines procured using budget funds” was adopted. Draft Order of the MOH “On Certain Issues of reference pricing for medicines included in the National List of Essential Medicines and procured using budget funds” was announced for the public discussion. Preliminary registration of participants and accreditation of mass media required. For more details contact Marketing department: +38 (044) 425 4050, news@l-a.com.ua. We will be glad to see you and your colleagues among the participants of the event!